A new HDMI to RCA cable that works as a signal transmitter however will not convert a signal. Please check our store if you need signal converter boxes. 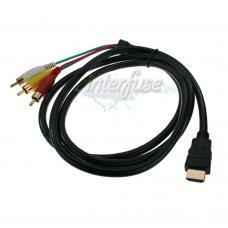 It is suitable for use with HDTV home theater systems and all other RCA to HDMI supported electronics. It is designed to transfer a signal from an RCA port to an HDMI port.